Employers are always hunting out for innovative ways to boost employee efficiency and productivity. But still the task of keeping employees motivated towards their work goal seems slightly difficult. Some employers believe that motivation for increased productivity is intrinsic, and hence, it is challenging to influence it via external factors. Other employers, however believe that there are countless great ways to enhance employee motivation and the significance is finding out what exactly the employees value. One of the basic ways employers adopt to enhance employee motivation, and hence increase efficacy and productivity are money. Employers use monetary incentives and pay schemes to alter their employee’s behaviors and maximize their output. But just like other incentives, even monetary incentives accompany certain pros and cons with it. 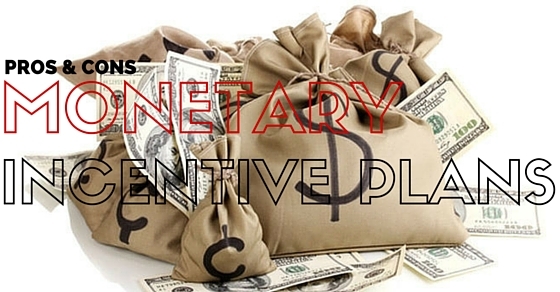 So, what does monetary incentive mean? As the name suggests, monetary incentives are money-based rewards, which are offered to the employees for increasing their productivity. Employers offer such rewards when an employee exceeds or meets the expectations. There are various types of monetary incentives that employers use to reward their employees. These incentives include stocks, cash bonuses, quarterly bonuses, profit sharing and other types of rewards that satisfy the fiscal zeal of the employees. A monetary incentive is typically provided in the form of bonuses and is offered for a job good done. Most of the employers opt for monetary incentives to reward their employees as money is the main source of satisfying the requirements of the people. Money offers financial security to people and also helps satisfying the social needs of individuals. In fact for such reasons, numerous organizations introduce bonus schemes and wage plans to stimulate and motivate their people at work. Besides such incentives, organizations also adopt non-monetary incentives to reward their employees. Know more about the major differences between these two types of incentives. The monetary as well as non-monetary incentives are offered to employees as rewards. But there are few major differences between these two types of rewards that are stated below. The sole purpose of monetary rewards is to benefit associates for wonderful job performance through money, including bonuses, profit sharing and more. Few organizations even offer paid vacations to their employees who excel in performance. On the other hand, non-monetary incentives reward employees for excellent performance at work, through lucrative opportunities, flexible work hours, education and training, pleasing work environment, work from home under special circumstances, and more. Just like the purpose, both types of incentives for employees differ in their kinds. Bonus, paid holidays, paid vacation time, employee discounts, company holiday parties, overtime pay, company discount vouchers and health benefits are some of the major types of monetary incentives that organizations offer to their employees. No matter which type of monetary incentive the organization adopts, it always has certain fiscal benefits associated with it. Both types of incentives are effective on employees, but since monetary incentives offer direct and lasting satisfaction so they are considered to be more effective than the non-monetary incentives. Rewards that increase the overall compensation of the employees provide them with lasting satisfaction, and hence, result in their increased productivity. Non-monetary incentives, such as a simple praise, recognition from the individuals they work with and also offer a high degree of effectiveness. Problems or issues associated with these incentives forms the other factor on the basis of which these two are differentiated from each other. Both these types of incentives are effective in one way or the other, but they may end with different consequences. It is because the performance based rewards encourage compliance rather than innovation and creativity. It implies that employees try hard to earn monetary benefits and awards and sometimes end up achieving their goals but are not able to think out of the box. In most of the cases, the monetary rewards are countable and hence employees can always keep a check on them. Non-monetary rewards, on the other hand, are mostly available in the non-countable forms and hence employees cannot make over a specific amount of such rewards that they have obtained from their organization. While these are the major points of differentiation between the monetary and non-monetary incentives, there are also some minor differences between these two types of incentives. Like monetary incentives offer direct satisfaction and direct feel of appreciation while non-monetary incentives are an indirect way of rewarding the employees. Also, it is easier for employees to keep a track record of monetary rewards or benefits, which they are able to obtain from the company. It is quite difficult for them to keep a record of non-monetary benefits that the company has offered to them. So now that you have known the major differences between these two types of incentives types, it is now time for you to get a note of pros and cons or advantages and disadvantages associated with the monetary incentives. The major advantage of the monetary incentives is that it is easy to implement and a straightforward way of rewarding the employees who deliver high levels of output. Employers who wish to reward their hard working employees and want their employees to notice it may adopt monetary incentives scheme. It is also a straightforward way to influence the potential behaviors of the employers. When adopting this method of incentive, there is no requirement of personalization. Every employer gets paid and they will not mind being paid more. So if your organization wants to reward employees then compensating them with lucrative benefits is an excellent way. Almost every employee wishes to be recognized and rewarded for high performance. Practicing monetary incentives to reward their high performance can not only help boosting their productivity but is also an easy way to offer them with extra compensations. It also boosts employee morale and employees always work hard to gain more such benefits. A monetary incentive scheme always provides employees with a feeling that their work is getting noticed and they will always be paid for their achievements and accomplishments. In such situation, not only they work hard to earn more such rewards but they even think of innovative ways with which they can conveniently accomplish their targets and achieve the goals. As a result, the employees build a positive approach towards work and the overall work atmosphere improves. Such incentives offer a direct satisfaction of the employees, and hence creates a direct impact on the employee’s productivity. Most of the employees work for money and with the possibility to achieve such rewards, they strive to work hard and make sure to improve their productivity. Only an employee who is focused at work is able to produce more in a specific time period. Only hard working employees are able to achieve their company’s goals. It is, therefore, a fair tool to judge your employee’s performance and reward him. If in case there is more than one employee who performs well then you can offer each one of them with monetary bonuses based on their performance percentage. In these situations, it always acts as a fair tool to judge your employee’s performance and reward them. It is among few of the incentive programs that offer employees with an element of control over their level of income. It is an excellent way to assure employees that they can make more money and get appreciated for their work. Employees, therefore, work hard to increase their overall level of earnings. It is not necessary that only one employee in your organization is delivering higher productive levels. There are chances that more than one employee reaps great level of output to the organization. In such case, you can either reward your employees with non-monetary incentives or can give them monetary benefits to offer a direct boost to their performance level. Every time it is not possible to offer well done employees with promotions. In such a case, you can always offer them these types of rewards as greet towards their performance. Since monetary incentives offer immediate satisfaction to the employees, you can always award them if in case you cannot offer them with promotion and also do not want to lose them. An incentive program is not only useful for rewarding high performing employees, but it is also an amazing way to recruit new, intelligent talents. Recruiters can always brief job hunters about incentive plans of the organization and attract them to join the organization. Just like any other incentive program, monetary incentives offer numerous benefits. However, there are also few disadvantages or limitations accompanying fiscal based incentives that are mentioned below. Although, monetary incentives are great for boosting employee’s productivity, but still there are possibilities that it could lead to few disadvantages as well. One major disadvantage of this reward is that other rewards or non-monetary rewards seem just an entitlement to the employer as compared to this type of incentive. In most of the cases, employees end up getting interested only in monetary rewards. There are possibilities that the organization is sometimes not able to reward their employees with the specified time. Also, it is possible that the firm is not able to provide all employees with the rewards. In such situations, it may demotivate the employees who do not get it. There are also chances that employees who strive hard to achieve their goals, but are not able to achieve it due to market related factors, may end up working less hard. Most of the times organizations create a fiscal based incentive plan that can help them reward the most only their best employees. So, employees who do not get it or get it less as compared to their co-workers may overlook their performance factor and hence may develop a sense of inequality. Any good thing comes with a cost and so does the monetary incentive plan. For any company that is looking forward or is planning to implement such a plan has to involve lots of time and manage things out in order to create an incentive scheme, which is beneficial from all the aspects. The managers also have to ensure that the incentive plan is not only well planned but is also well executed. There are situations when a monetary based incentive plan may not work out positive for the organization. If an employee is doing work from home or is working late hours at home and in the office, then it becomes difficult for the organization to track the record of the employee in these situations. So in circumstances like these, a monetary incentive plan does not work out well. If employers do not wish to avail any sorts of disadvantages with their monetary incentives plan, then they should plan out an incentive scheme that is fair and boosts individual as well as team performance. Employers should monitor their employee’s performances and offer them with goals that are readily and objectively measured. The best way to reward employees is to use a mix of monetary as well as non-monetary incentives.